Hello everyone! Jerm here with an update on something I know you have all been waiting for! Yup... It&apos;s Dragon Boat Racing time here in Tampa Bay! Racing for the 10th IDBF World Dragon Boat Racing Championship will kick-off this Wednesday, Aug. 3, and Yacht StarShip Dining Cruises is providing the best seat in the house. The Yacht StarShip, a 180-foot luxury dining yacht, will act as the Finish Line Boat throughout the World Championship. Fans have the chance to see the action up-close-and-personal from the Yacht StarShip, America’s first 3-diamond rated Dining Yacht by AAA, as the teams cross the finish line. Admission on to the Yacht StarShip is $5, and there will be a cash bar and food available. Additionally, the Yacht StarShip will be serving a lunch buffet for an additional cost on Saturday, Aug. 6 and Sunday, Aug. 7 from 11 a.m. to 2 p.m. The Yacht StarShip will be docked in front of Jackson’s Bistro on Harbour Island starting Wednesday, Aug. 3 and attendees can pay at the door. The 10th IDBF World Dragon Boat Racing Championship will take place on the Seddon Channel in downtown Tampa, marking the first time the Tampa Bay area has hosted the event. The racing begins on Wednesday, Aug. 3 and concludes on Sunday, Aug. 7. I don&apos;t know about you guys, but I am quite excited about this week and all of the paddlers in from all over the country for this event! 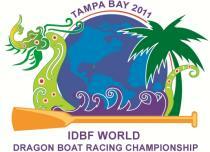 If you need more information on on anything Dragon Boat related, including race schedules and public events, visit www.tampa2011.idbfworldchamps.com. That&apos;s all I got for now for you folks, but be sure to stay tuned in for more Tampa Bay Sports and Tampa Bay area events!